How do the media represent obesity and eating disorders? How are these representations related to one another? And how do the news media select which scientific findings and policy decisions to report? Multi-disciplinary in approach, Obesity, Eating Disorders and the Media presents critical new perspectives on media representations of obesity and eating disorders, with analyses of print, online, and televisual media framings. Exploring abjection and alarm as the common themes linking media framings of obesity and eating disorders, Obesity, Eating Disorders and the Media shows how the media similarly position these conditions as dangerous extremes of body size and food practice. The volume then investigates how news media selectively cover and represent science and policy concerning obesity and eating disorders, with close attention to the influence of pre-existing framings alongside institutional and moral agendas. 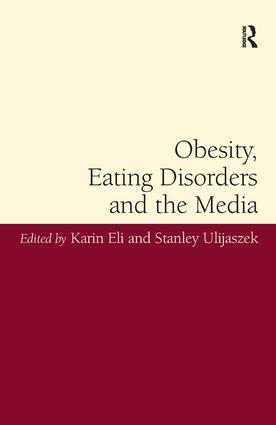 A rich, comprehensive analysis of media framings of obesity and eating disorders - as embodied conditions, complex disorders, public health concerns, and culturally significant phenomena - this volume will be of interest to scholars and students across the social sciences and all those interested in understanding cultural aspects of obesity and eating disorders. Karin Eli is Postdoctoral Research Fellow in the School of Anthropology and Museum Ethnography at the University of Oxford, UK. Stanley Ulijaszek is Professor of Anthropology at the Institute of Social and Cultural Anthropology and Director of the Unit for Biocultural Variation and Obesity and of the Institute of Social and Cultural Anthropology at the University of Oxford, UK. He is co-editor of Insecurity, Inequality, and Obesity in Affluent Societies; The Cambridge Encyclopedia of Human Growth and Development; Health Change in the Asia-Pacific Region; and Holistic Anthropology: Emergence and Convergence, and editor of Health Intervention in Less Developed Nations.